For the most part, the Forest Service built the roadssome 380,000 miles of themnot for visitor use, but to make possible the management and harvesting of forest lands. 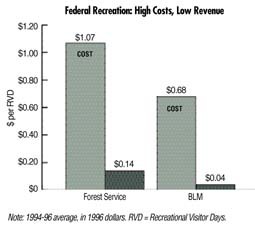 Since timber harvesting has been greatly reduced or eliminated, the Forest Service has lost millions in revenue and has less and less in its budget for maintaining roads and trails. In a way, shutting off roads to vehicular use is, like the spotted owl, another surrogate method of preventing logging and, as is frequently argued, creating defacto wilderness without going to the trouble of congressional approval. Yet recreation groups like the Blue Ribbon Coalition have been willing to aid in road maintenance and improving trails, and their numbers alone would indicate some possibility for the Forest Service to address its budget problems in another way. Unclear figures indicate that before major road closures, off-road vehicles accounted for more than 90 million visitor days a year in the National Forests, with the figure steadily growing. The numbers could present some possibility for opportunity or, as has actually happened, for confrontation. With roads closed, the Forest Service now contends, ORV operators cut fences and make their own roads, thus leading to more damage in the forest and to inevitable confrontations with authority. Yet associations and industry groups have repeatedly offered help and adopt a trail assistance to federal authorities and have stressed environmental concerns to their memberships. The National Off Highway Vehicle Conservation Council organized in 1990 now has members in 40 states and conducted a survey of off-road users in 1998 that determined: the average age of OHV users is 39; nearly 60 percent are married with family; and one-third are employed as professionals and more than half have attended college. Average income was placed at $44,000 a year. Not only are they not likely to destroy existing roads and trails, polls among OHV users have indicated support for paying fees for use, so long as those fees were directed to actual maintenance. actions of the federal administration on behalf of a single environmental agenda that favors non-management of the forest and puts aside the investments of the past. The network of Forest Service roads represents a distance eight times longer than the interstate highway system. The maintenance backlog for road repair by the Forest Service is currently over $10 billion. Digging tank traps and closing access to up to 60 million acres of forest doesnt seem a likely solution, but it is so far the policy of the Forest Service. Bruce Babbitt brought his attitude with him when he moved from the League of Conservation Voters into the top job at the Department of Interior. The former Arizona governor had aspired to be President of the United States, and short of that to become a Justice of the U.S. Supreme Court, but when Bill Clinton named him as Secretary of the Interior, it was with the urging of politically powerful environmental interests. They considered Babbitt to be their heavy hitter, our Babe Ruth as one of them put it. From the beginning, Babbitt did not disappoint them, naming no less than 20 executives from their own non-profit ranks to key posts in the nations land-managing authority, including George Frampton of the Wilderness Society to become Assistant Secretary for Fish & Wildlife. Interior had long been regarded as the most thankless Cabinet post, and the least likely to promote a future career. It carried the baggage of inevitable controversies over management of the nations enormous public lands, and of wrenching decisions to be made between competing interests. Despite his well-known arrogance, Bruce Babbitt regarded himself as a peacemaker. He has presided over the last eight years in perhaps the most contentious period in the history of the department. Americans are not at war with each other. More than ever today, we are more alike than we are apart in our beliefs, ambitions, and ideology. Clearly the most powerful and richest nation on the planet, we are at once its greatest consumers and its most ardent protector, a seeming contradiction of ourselves. Most Americans today say they regard themselves as environmentalist, because to say otherwise would deny some of the most evident truths about abuses caused by human behavior in the past. Still, saving the whales or protecting the rain forest or finding simple truth in the behavior of predators misleads many of us in an attempt to identify our adversaries. In order to secure the planet for future generations, we are told, we must overcome a vaguely-defined villain among ourselves, a force that, if left unchecked, will destroy the future. Note: 1994-96 average, in 1996 dollars. RVD = Recreational Visitor Days.